We spent a weekend in Rochester recently for a family wedding, and though we didn't even scratch the surface of the good restaurants in this gateway to Western New York, we ate pretty well when we had the chance to steal away from the family festivities. Shawn almost never submits his own restaurant request, so when he does, I tend to acquiesce. 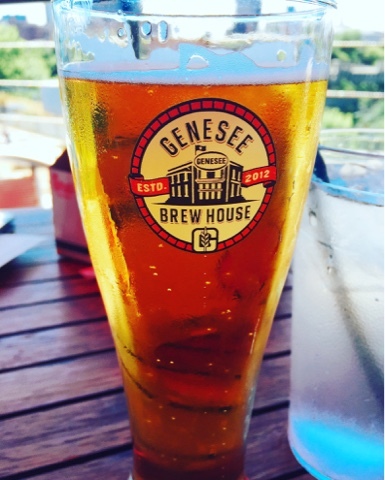 He wanted to do lunch at the Genesee Brew House, which is located right in the Genesee Brewery, where all your Genny Cream Ale dreams become realities. The menu is basically bar food, with some nods to German and Western New York specialities. We were staying at the Grand Hyatt near the convention center, and assumed that walking would be a smart way to get to the brewery, since downtown Rochester must have fun shops and coffee houses and the like. I should have known better than to assume that anything nice is ever located around a convention center. It's pretty rough in this part of downtown, and later on, Shawn's family asked us how we avoided being stabbed on our journey. Fair question. I understand that convention centers are often built in less savory neighborhoods, since that land is cheaper and such facilities require massive square footage, but when that influx of visitors fails to gentrify the area, it's always confusing to me. Don't local cafes and boutiques want to locate themselves in affordable neighborhoods with tons of hotel rooms? Maybe my understanding of urban planning is less honed than I think. Despite some brushes with sketchy streets and inhabitants, we passed the impressive High Falls and arrived at the Genesee Brewery, which is a beacon of prosperity in this bleak, derelict landscape. 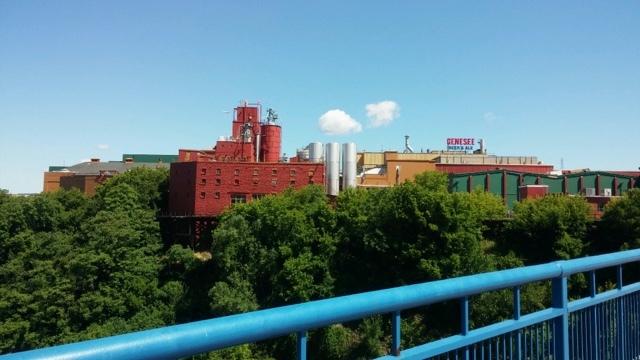 We sat on the deck, overlooking the pedestrian bridge and river, and ordered up a delicious Pilsner that would make you second guess if you're drinking a Genny. We ordered the buffalo chicken pierogies as our starter, because those two things combined are a pretty terrific idea. 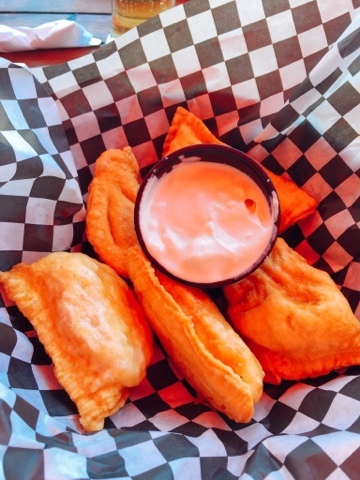 They were good in practice as well in theory - crispy fried dough pockets filled with juicy, pulled, white meat chicken tossed with wing sauce. Big chunks of blue cheese in the dipping sauce completed the buffalo wing flavor profile. We loved them. In honor of our proximity to Western New York, I ordered the beef on weck for my lunch. 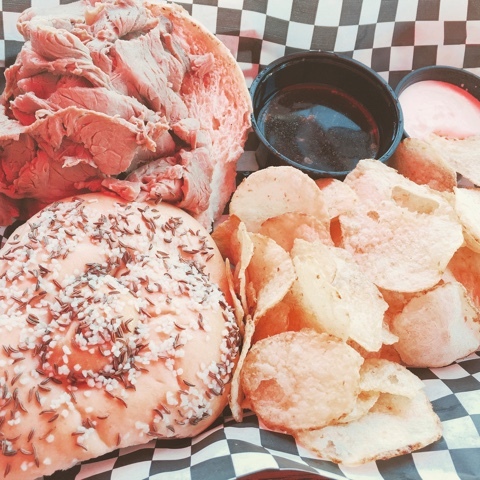 Weck is Buffalo slang for something called a kimmelweck roll, which is a German construct of a white roll topped with caraway seeds and coarse salt. The roll is stuffed with rare roast beef, which is served with horseradish sauce (in this case, horseradish mayo) and au jus for dipping. For the most part, this was a delicious sandwich, except that our waitress spilled the jus during the basket's trip to our table, so the bread was all soggy and falling apart before I had a chance to dip it. In the end, it had to become a kife and fork sandwich so that I didn't end up wearing more than I could eat. A French fry option also would have been nice with the sandwiches - they only serve plain chips at the Brew House. Shawn got the fish tacos, which were a lot better than some other fish tacos that I've suffered through lately in Upstate NY. These were dressed with a sweet cole slaw and avocado slices, with beer-battered and fried cod. Rice was served alongside with some black beans mixed in, which was simple, but well-seasoned. For my money, these still couldn't touch Southern California fish tacos in vibrancy, but they were reasonably tasty. 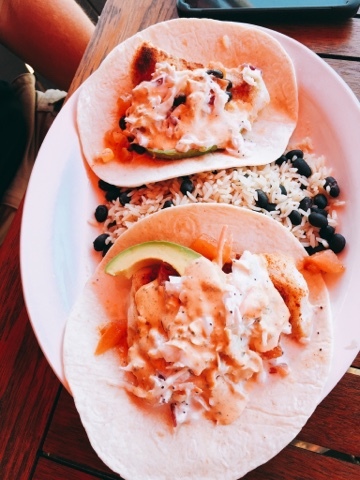 The so-called "Baja" cream sauce over top was a little muddled in flavor, but helped add the creaminess and citrus you needed with the fish and the slaw. I guess I was just missing any sign of spice or heat, just as with most Mexican or Tex Mex food served in our state. It's all lacking in chiles, for me. 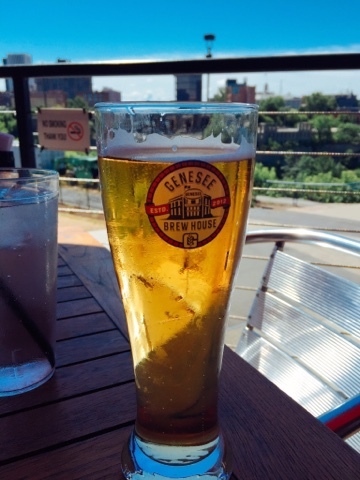 Our waitress had a great personality, and it was lovely and relaxing out on Genesee Brew House's second floor deck. We had fun in the gift shop downstairs, too, perusing vintage Genny gear in the industrial chic space that once housed the brewery's actual equipment. This was a welcome breather during a somewhat hectic wedding weekend, and even though the food wasn't knock-your-socks-off spectacular, we enjoyed the experience. 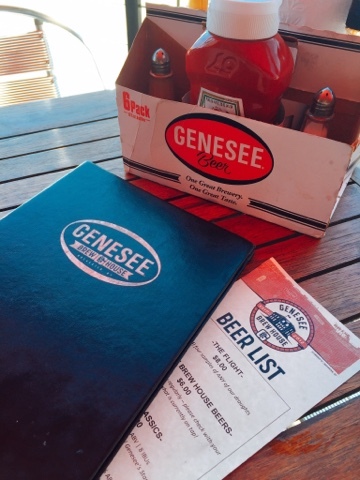 I give Genesee Brew House a six on the BHS scale. 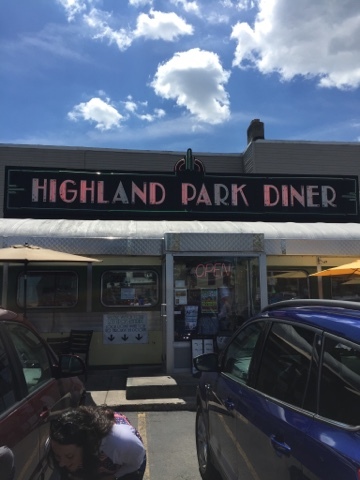 The next morning, we ventured to the Highland Park Diner for breakfast with family, and though seating space was at a premium in this vintage diner, the food was simply primo. 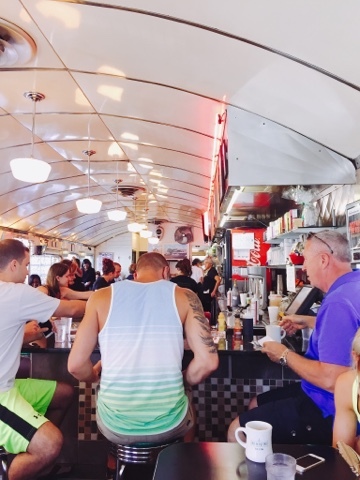 We were spread out between a couple of tables and some counter seats, as our party was large, but that didn't stop me from sampling a bunch of the specialities from the diner's gargantuan menu, which is crammed with decadent breakfast eats. As you can see, this is is a full-on dining car-style diner, with chrome accents and a counter running the length of the dining room. Those counter seats afford you a view of the line cooks hustling in front of the flat top griddle, the mark of good diner food. The corned beef hash, perhaps the most righteous food to hit our table that morning, reflects this badassery. 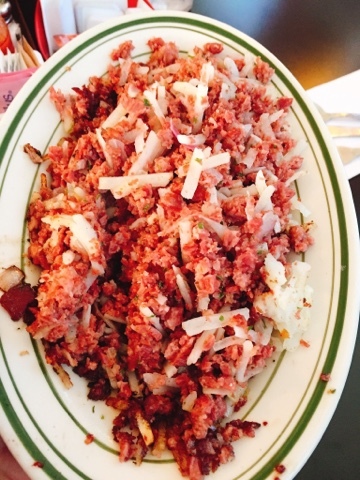 Good corned beef hash is an art form, and you won't convince me otherwise. You can't get it from a can, and even buying deli counter corned beef doesn't really do the job. This was a straightforward presentation of cubed meat and shredded potatoes with a bit of fresh, green parsley in the mix, but what I loved was that the beef brisket had been "corned," or brined with some sweet pickling spices, to take the edge off the robust saltiness you usually get beat over the head with when eating this delicacy. So you had some sweet flavor mingling with the fattiness and that cured meat flavor, plus the bland earthiness of the potatoes and just a tiny hint of freshness from the herbs. It was all crisped up on the flat top to achieve golden brown, crispy deliciousness, as the diner gods dictated. You know, in accordance with the prophecy. I am not ashamed to admit that I vacillated for an inordinate amount of time between two benedicts on the impressive list of 15 or so combos of breads, eggs, meats and sauces. The Irish Benedict, with that corned beef hash, was singing a very seductive song to me; we had had a late and boozy night, and that level of salty fattiness sounded good. Luckily, Cousin Sue ordered the side of it you're seeing above, which clinched my choice of the Country Benny. Two biscuits, two eggs, sausage patties, and cream gravy. Um, yes please. Hell, I went to bed at 10:30 last night, and I would like some of that right now. This dish was satisfying, hearty, and filling, but unfortunately not the perfection I hoped for. The gravy needed a good pinch of salt, several grinds of black pepper, and maybe a tiny bit of nutmeg to elevate its relative blandness. The sausage, I believe, was made in-house, but was lacking somewhere in its own flavor profile, as well. It was more sweet than salty, and didn't carry especially strong pork flavor. In my opinion, some red pepper flakes and garlic in the mix would have helped. I tasted fennel, which is a plus, but just not a lot of the natural flavor of the meat. The potatoes were nicely griddled, for texture, but also lacked seasoning, which I remedied with the salt, pepper and ketchup on our table. 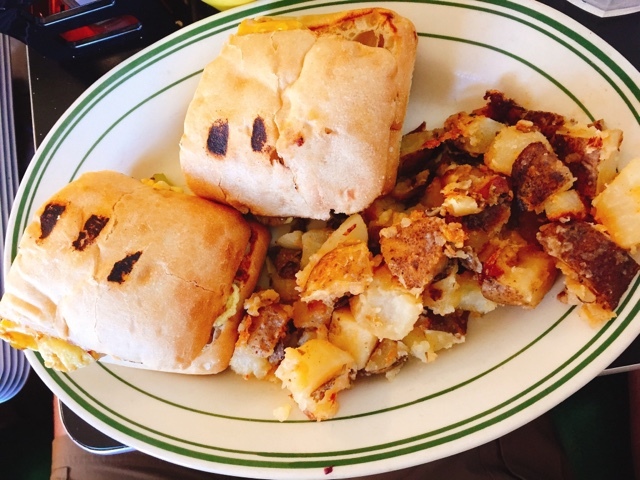 Shawn ordered the bacon breakfast panini on special that day, which came with bell peppers and cheddar cheese on it. The peppers added nice sweetness to this toasty, crusty, ciabatta-based scrambled egg sandwich, while the cheese added needed richness. In addition to the hash, which she shared around the table, Sue tried the mixed berry pancakes, which were a total sugar bomb. While the berries and whipped cream rendered this sweetness overload for me, I did note that the pancakes themselves were light and creamy - wonderfully textured and very yummy. Cousin Bob went for the breakfast garbage plate. 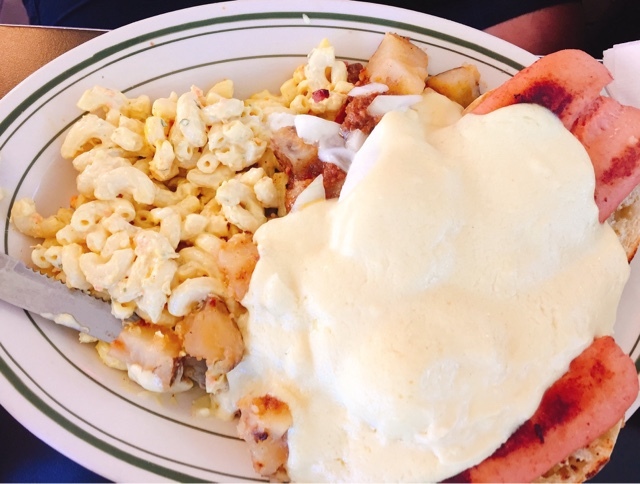 You know about garbage plates in Rochester, right? 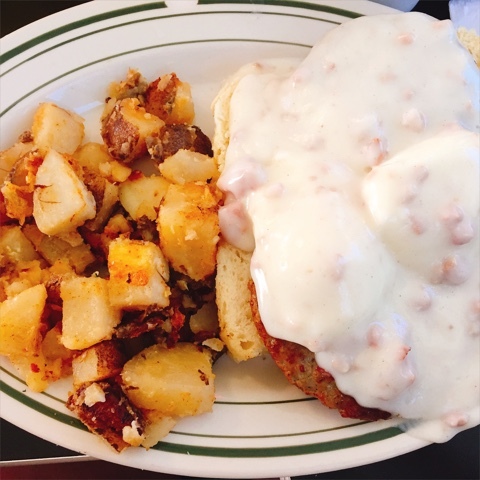 This late night city specialty just makes sense as a soak-up for a morning after, with hot dogs and macaroni salad sharing the platter with eggs, home fries and English muffins, plus a slathering of hollandaise. This is a great riff on Nick Tahoe's Classic, but in this case, Bob didn't care for the macaroni salad, and left it behind on his plate. I don't blame him; it looked very gloppy and yellow to me. Macaroni salad is such a personally subjective dish - most people only like their own family recipe. I'm one of those people, and in my world, mustard has no place in it. The coffee at Higland Park Diner is a custom roast only available there, and it was strong and smooth. Our lovely, if brusque, waitress brought lots of it, despite how busy she was tending to the packed dining room, and I was grateful. I give the diner a seven out of 10 on the BHS scale. I admired the variety of food here, and the hall of fame hash and coffee were top notch, but some of the other elements lacked seasoning, for me. I can see why this place is packed on a Sunday morning - there's something here for everyone and the choices are staggering - but I recommend sticking to the corned beef. That's all for this week, Hungries. If you're not already, please join the BHS Squad over on the Big Hungry Shelby Facebook group for more news, tips and Upstate NY food, and on Instagram and Twitter @BigHungryShelby. My personality is big; my hunger is bigger! Corned beef hash is one of my most favorite things ever. That looks divine. I definitely would have ordered those pierogies. People who works there are some of the sweetest people I've met. Save yourself some time and just go there. Everyone at event venue Chicago is sweet and ask how you've been, even though normally staff keep their heads down. Other places just quoted me $300 and up to create exact replicas of the centerpieces from a wedding. They creativity led to an amazing arrangement that my wife is still talking about. The Flower Delivery price was very reasonable as well.